What Henry J. Kaiser is already doing to meet the housing shortage in the Los Angeles area he regards as a sample of what he will be doing shortly near Detroit, Portland (Oregon), and other of our cities. Teamed up with Fritz B. Burns, veteran Los Angeles land developer, Kaiser is completing 1,700 homes near the California city, and before the year is over he expects to put up 10,000 more, there and elsewhere. 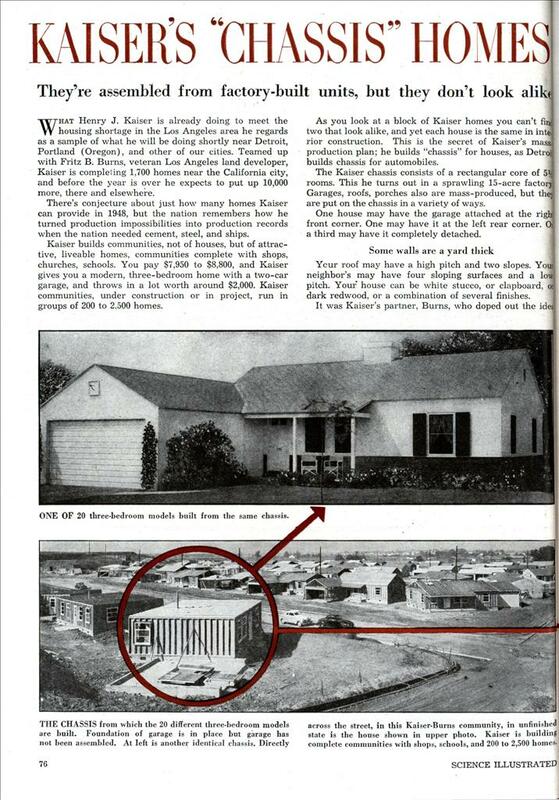 There’s conjecture about just how many homes Kaiser can provide in 1948, but the nation remembers how he turned production impossibilities into production records when the nation needed cement, steel, and ships. Kaiser builds communities, not of houses, but of attractive, liveable homes, communities complete with shops, churches, schools. You pay $7,950 to $8,800, and Kaiser gives you a modern, three-bedroom home with a two-car garage, and throws in a lot worth around $2,000. Kaiser communities, under construction or in project, run in groups of 200 to 2.500 homes. As you look at a block of Kaiser homes you can’t find two that look alike, and yet each house is the same in interior construction. This is the secret of Kaiser’s mass! production plan; he builds “chassis” for houses, as Detroit builds chassis for automobiles. The Kaiser chassis consists of a rectangular core of 5-1/2 rooms. This he turns out in a sprawling 15-acre factory Garages, roofs, porches also are mass-produced, but the) are put on the chassis in a variety of ways. One house may have the garage attached at the right front corner. One may have it at the left rear corner. Or a third may have it completely detached. Some walls are a yard thick Your roof may have a high pitch and two slopes. Your neighbor’s may have four sloping surfaces and a low pitch. Your house can be white stucco, or clapboard, or dark redwood, or a combination of several finishes. It was Kaiser’s partner, Burns, who doped out the idea of varying the exterior appearance of the factory-built homes to keep them from looking like just that. Already he and Kaiser are developing 11,500 lots on 2,000 acres in southern California sites. Their factory builds, besides the “chassis” units, wall panels, ceiling and floor panels, plumbing and kitchen cabinets. Take as an example a panel that is a wall between bedrooms. It’s a yard thick, because it is complete with closets, cabinets, vanities. In all, 40 panels go into a three-bedroom house. (The builders place less emphasis on the two-bedroom models they have been turning out.) “Gone are the old” ways In addition to shifting garages and changing roof shapes, Burns and Kaiser use varying set-back plans, which, coupled with varying porches and exterior finishes, make an amazing difference in house appearance. Burns says that gone forever are the old days when builders could get by with only four designs, so that two out of five houses were alike. From their basic three-bedroom chassis, he and Kaiser get no fewer than 20 different designs. I wonder if there are any of these left just as there only a few of the Lustron metal houses left. I had to laugh about only 4 or 5 designs available. The MacMansions in my town only have only 4 or 5 designs; the only variety is brick color and reversed plans. The development is known as Panorama City. A quick look at Google Maps suggests that probably a fair number of the original houses are still around there–they seem to have many with about the same basic size. It’s hard to be sure, though. 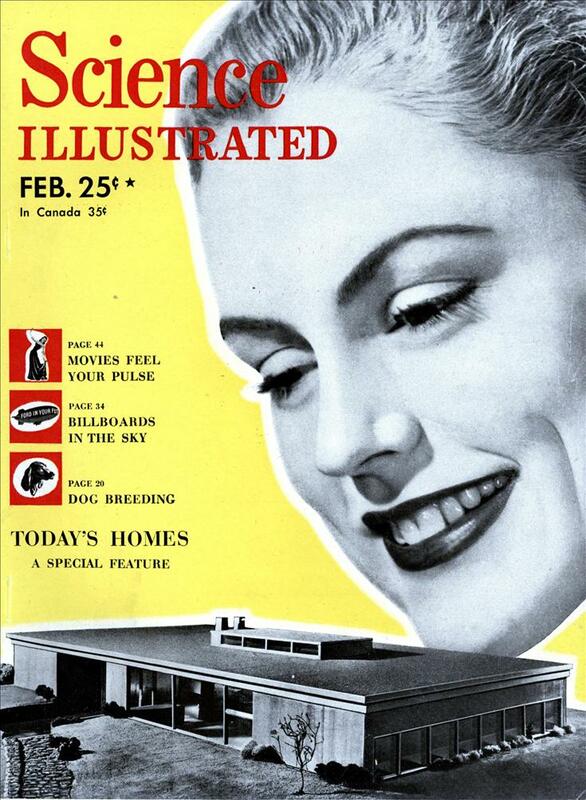 Except for the location of the garage (which in our case was a carport) the floorplan of the Kaiser house shown on the third page is identical to that of the stick-built house my dad bought in Little Rock in 1960. Our neighborhood was built with a limited number of floor plans, and you couldn’t tell which houses were identical in most cases, until you were inside. That neighborhood was built in the 1950’s. The house my parents bought was one of the last built…in 1958.